½ oz Dry parsley, chopped . 1 oz Worcestershire sauce . Sauté onions, celery, and garlic in butter until translucent. Combine thyme, wine, parsley, pepper and Worcestershire sauce. Mix well. Place crushed crackers in large bowl. Pour wine mixture into cooked veggies. Mix well. Combine veggie mixture with crushed crackers. 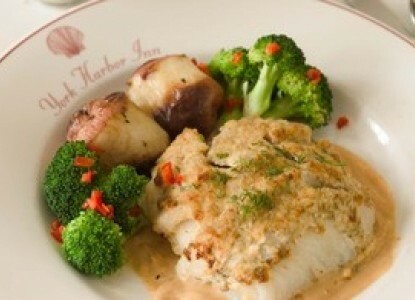 Lay 6 oz haddock filet over 4 oz of stuffing. Top with 1 Tblsp dill dressing (see next recipe) and lightly cover dressing with buttered bread crumb. Bake in a casserole dish at 350" with white wine and a little butter, for 25-18 minutes. Combine all ingredients in a mixing bowl and whisk to blend.